Labour has received a major boost to its election campaign in Southport after newly released figures showed a big swing towards it. The figures, compiled by Sefton Borough Council’s Electoral Services department, indicate that five out of seven of the town’s wards voted for Labour in the recent Liverpool City Region Mayor elections. Labour’s successful candidate, newly elected Region Mayor, Steve Rotherham, is reported to have polled nearly 20% more votes in Southport than his nearest rival, the Conservative candidate, Tony Caldeira. Labour took the vote in all of the town’s wards except Cambridge and Dukes, which went to the Tories, while the Lib Dems lost out in all. 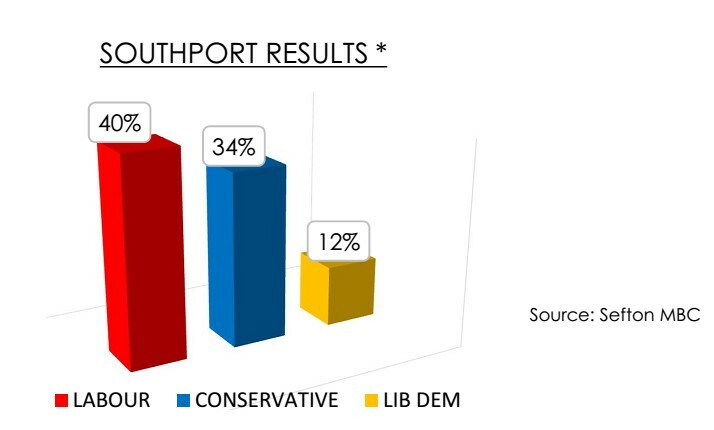 The figures show that Labour’s vote in Southport was over three times that of the Lib-Dems and more than the whole of their Liverpool City Region Mayor vote in Sefton. * Number of votes recorded across all Southport wards (may include some mixed postal votes from across Sefton) 2017 Liverpool City Region Mayoral Election. Next Next post: #GE2017 – The Tactical Vote in Southport? It’s now Labour!